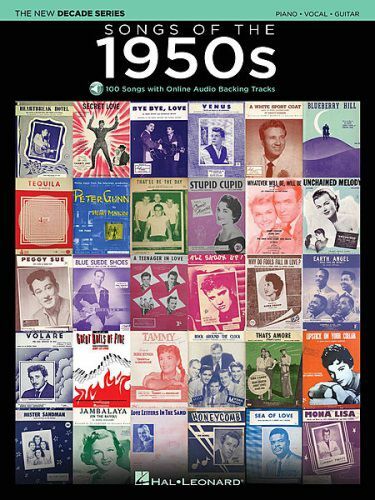 The 1950s brought a fresh energy to pop music and big changes started showing up on the charts and in the clubs. This book gathers 100 of the most influential and endearing songs and lets you play along with orchestrated backing tracks that make you sound like a pro. You access the tracks online for streaming or download. Songs include: Ain't That a Shame · All Shook Up · At the Hop · Be-Bop-A-Lula · Blue Suede Shoes · Blueberry Hill · Chantilly Lace · Come Go with Me · Don't Be Cruel (To a Heart That's True) · Earth Angel · Fever · Great Balls of Fire · Heartbreak Hotel · Hound Dog · I Walk the Line · Jailhouse Rock · Jambalaya (On the Bayou) · Love Me Tender · Mister Sandman · Mona Lisa · Peggy Sue · Peter Gunn · Que Sera, Sera (Whatever Will Be, Will Be) · Rock Around the Clock · Sixteen Tons · A Teenager in Love · Tequila · That'll Be the Day · Unchained Melody · Volare · Why Do Fools Fall in Love · Yakety Yak · You Send Me · Your Cheatin' Heart · and more.